FLEET-ONE SCA PRECHARGED HEAVY DUTY ANTIFREEZE/COOLANT PINK is fully formulated antifreeze designed to provide superior engine protection for heavy duty cooling systems. For years heavy duty operators were limited to using low silicate automotive antifreeze that require the addition of a separate supplemental coolant additive (SCA) at initial fill and top off. While this was effective, it resulted in mixing errors when the SCA was added. To prevent SCA variability caused by mixing errors, and to improve convenience. 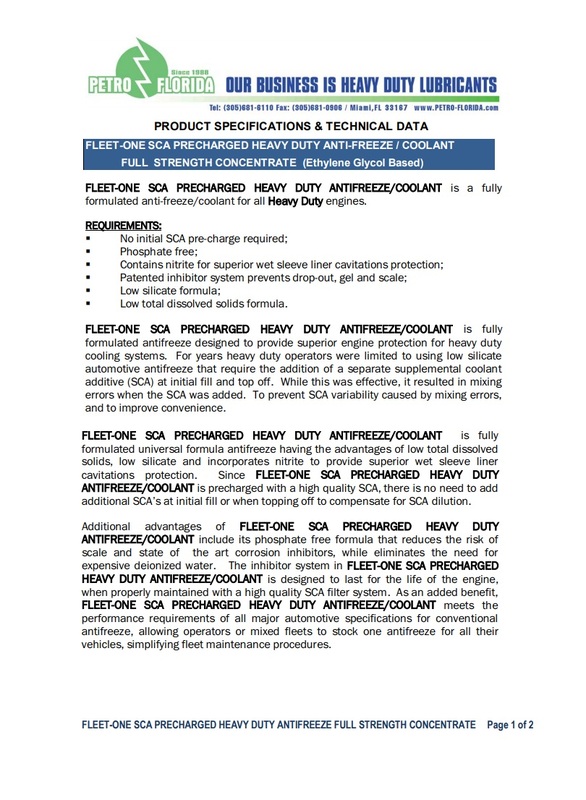 FLEET-ONE SCA PRECHARGED HEAVY DUTY ANTIFREEZE/COOLANT is fully formulated universal formula antifreeze having the advantages of low total dissolved solids, low silicate and incorporates nitrite to provide superior wet sleeve liner cavitations protection. 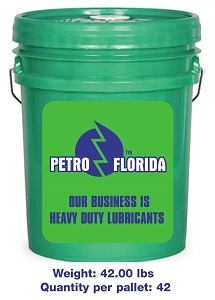 Since FLEET-ONE SCA PRECHARGED HEAVY DUTY ANTIFREEZE/COOLANT is precharged with a high quality SCA, there is no need to add additional SCA’s at initial fill or when topping off to compensate for SCA dilution. 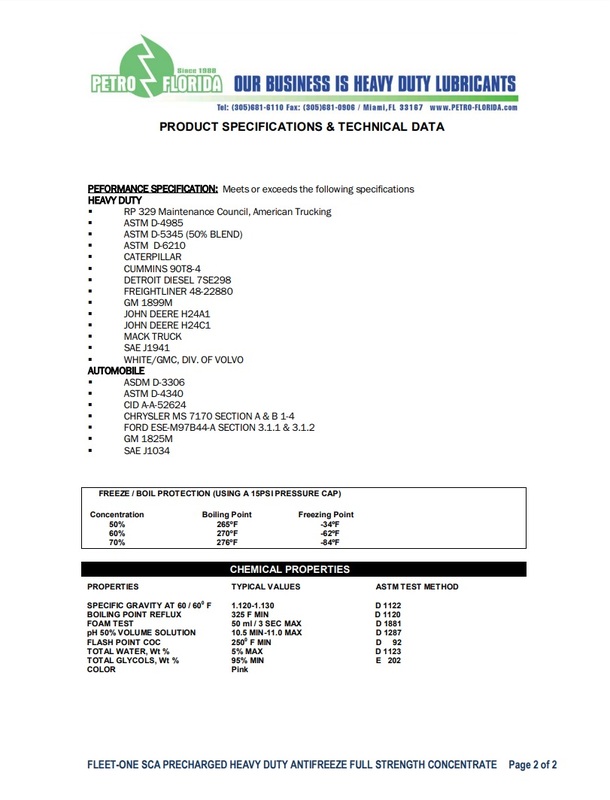 Meets or exceeds: ASTM D6210, D4985, D3306, TMC of ATA RP329/330,TMC of ATA RP 302A, Mack, Cummins, Caterpillar, Detroit Diesel, Fteightliner, Volvo, JohnDeere, Chrysler, Ford, GM, WHITE / GMC.